On September 2, 2015 I had the honor of filing a legal action on behalf of workers at the Hanford Nuclear Site. The goal of this lawsuit is to compel the US government to implement the safety recommendations of its own experts and to add the safety measures to Hanford’s high-level nuclear waste tanks to protect workers against the toxic vapors emanating from them. In short, we sued the federal government to stop the poisoning of workers who are on the front lines of one of the world’s largest environmental remediation projects. Here’s a bit of background from our complaint: The 586-square-mile Hanford site was a Manhattan Project site where the US government produced plutonium for atomic weapons until the late 1980s. Hanford, owned and managed by the US Department of Energy (DOE), produced much of the nation’s supply of plutonium, which resulted in the nation’s largest quantity of deadly high-level radioactive and chemical byproducts, the most toxic of which are stored in underground tanks. Hanford has 177 underground storage tanks that hold a total of 56 million gallons of high-level nuclear waste and toxic chemical waste. Over 1500 chemicals have been detected in the vapors contained within Hanford’s tank headspaces, any number of which can and do escape through tank equipment. Hundreds of employees work in and around the Hanford Tank Farms on a daily basis around the clock. Pipefitters, construction workers, electricians, millwrights, nuclear chemical operators, health physics technicians, and others comprise the bulk of workers who routinely encounter potentially toxic vapors with inadequate or non-existent protective equipment, despite continued efforts to make personal protective equipment a requirement for workers on these areas of the site. Workers check the area near the tank where a radioactive leak occurred on July 27th at the Hanford Nuclear Reservation. Hanford Challenge and the United Association of Steamfitters and Plumbers, Local 598, represented by Smith & Lowney, PLLC and Public Justice, filed suit in Federal Court against the DOE and its current Tank Farm contractor, Washington River Protection Solutions. This case was a long time coming. 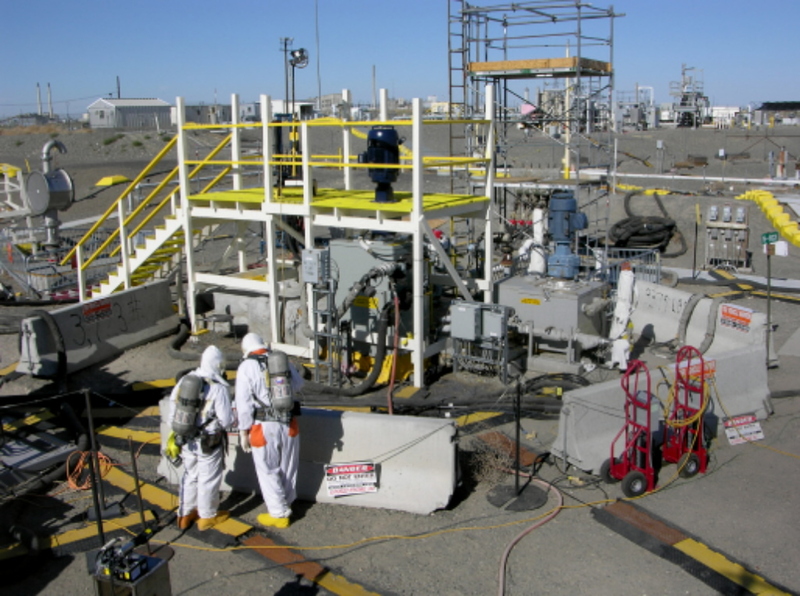 Hanford Challenge and UA Local 598 first tried every avenue short of litigation to address the repeated endangerment to their members from Hanford’s high-level nuclear waste tanks. Workers have been exposed to toxic vapors from Hanford’s high-level nuclear waste tanks for decades. Government agencies, organizations, scientists, and independent panels have written nearly 20 reports on the issue of toxic vapors in Hanford’s tank farm. There have been copious media exposes on workers made sick from exposure to Hanford’s toxic tank vapors. One of the Department of Energy’s own expert reports, released in late 2014, determined Hanford’s program to protect workers is inadequate. Findings and recommendations from this report and numerous past reports on Hanford worker exposure to toxic tank waste vapors have yet to be implemented making the need for legal action apparent. The lawsuit seeks (1) immediate institution of protective measures to prevent toxic vapor exposures, (2) implementation of systemic changes to Hanford’s chemical protection program, and (3) comprehensive medical monitoring for past and present Hanford tank farm workers. It is meeting these workers, learning of their experiences, their illnesses, their commitment to their work and the mission of safely securing the nuclear waste stored at Hanford that both inspires and enrages me daily. Far too many Hanford workers have been needlessly exposed to tank vapors and suffered numerous acute and long-term health effects. These include nosebleeds, metallic taste in the mouth, headaches, coughing, sore throats, nausea, and increased heart rates. Some Hanford workers have suffered permanent long-term disabilities stemming from brain damage, loss of lung capacity, damage to the nervous system, and cancer. Since just 2014, over 50 individuals working in or around Hanford’s tank farms have experienced symptoms of exposure to toxic vapors from the waste tanks. More than ten exposure incidents occurred between the time we sent DOE and WRPS our notice of intent to sue and filed our complaint, and exposure incidents have continued to occur since the complaint was filed. Many of the exposed individuals continue to work at the site and are concerned about the health effects they have or may experience as well as their risk of future endangerment. Their future endangerment is preventable. The legal hook we are using is the Resource Conservation and Recovery Act (RCRA) which amended the Solid Waste Disposal Act of 1965. Hanford tanks contain “Radioactive Mixed Waste” or “Mixed Waste” that contains both hazardous waste subject to RCRA (RCRA Section 1004(5)) as well as radioactive waste subject to the Atomic Energy Act of 1954, as amended. Congress’ objective of RCRA is to “promote the protection of human health and the environment” from the potential hazards of waste disposal. See RCRA 42 U.S.C Section 6902. RCRA also gives a cause of action for citizens to sue any person, including a government agency who “contributed and continues to contribute to the past and present handling, storage, treatment, transportation, and/or disposal of solid and hazardous waste in such a manner that may present an imminent and substantial endangerment to health and the environment.” See RCRA 42 U.S.C. Section 6972(a)(1)(B). 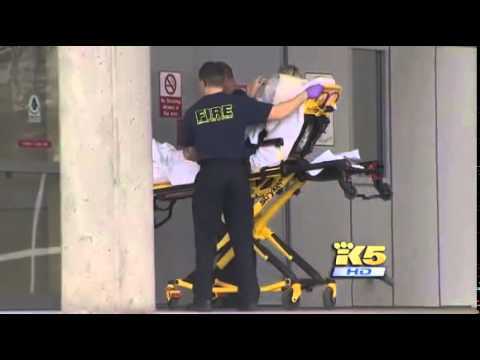 A Hanford worker exposed to toxic vapors is transferred to the hospital. This law, enacted to regulate the treatment, storage, and disposal of solid and hazardous wastes, has rarely been used for the purpose of worker protection. Most RCRA citizen suits have involved harm to the health of the environment and communities near toxic waste sites. It is important to note that Department of Energy contractors, such as WRPS, are exempt from the Occupational Safety and Health Act of 1970 and OSHA enforcement because Hanford is a Department of Energy weapons facility which self-regulates the safety and health of its workforce. Therefore, we invoked our most protective environmental law to seek the protection of those who are not only most at risk of endangerment to their health from Hanford’s hazardous waste, but also those who are tasked with monitoring and working with Hanford’s tanks and tank waste to alleviate the risk of further endangerment to health and the environment. If we are to protect our environment, we must first protect for those tasked with doing the work of monitoring and stabilizing the most dangerous concoctions humans have created. Meredith Crafton is an attorney at Smith & Lowney, PLLC. Before joining Smith & Lowney she worked as Staff Attorney for Hanford Challenge.